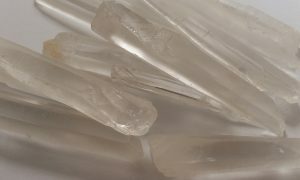 Singing Quartz are quartz points that look similar to laser wands in that they are long and clear. They are more common as single terminated but I have also seen them as double terminated. You can also get them with the Lemariun Lines. These crystals were first discovered in Brazil, however they also can come out of Tibet and other areas. You can tell it is a Singing Quartz due to the sound it makes as they hit each out, it is a clear sweet tone rather than the normal clunk of quartz hitting quartz. The high pitch sound of the crystals is said to make the ohm sound and is said to be created by extraterresrials or higher vibrational beings in order to make contact easier with them and to send us messages when we are ready to unlock the knowledge. A wonderful experience is gained by meditation on the sound of the crystals touching each other.